Sometimes I get in ruts. Ok, a lot of times I get in ruts. While I haven’t quite fully diagnosed the infinite catalysts to these ruts I’ve narrowed them down to some high level buckets. By the way I don’t actually ever intend to have them all diagnosed and figured out…gave up on that last week. I won’t go into a ton of detail about the buckets but I suspect you can relate to quite a few of them (stress, diet woes, depression, career challenges, relationships, boredom with <fill in the blank>). I have come to see that one of my most common instigators is simply being overwhelmed with the infinite To Do list. If I don’t address the stress this causes it ripples into other issues and greatly affects my quality of life putting me into a rut. It’s really only been over the past two years where I have become incredibly aware of this. Not only does it negatively affect me, but those around me as well. So when I feel the onslaught of overwhelming feelings coming on I try to follow a simple process that has really helped me. First step – get the stuff on a list…an actual list. It’s not new news that writing things down on lists helps ease the mind. I’m pretty sure people have been writing lists for centuries (The Ten Commandments Yo) and recent studies have shown that it really does ease the mind to write stuff down. I have always wanted to say “recent studies have shown.” Anyway, I find that I like to write down my quick hitter tactical items on paper either in a note book or on a post-it. I keep my personal items separate from my work related items. The work to do list stays at the office by the way. These are the things I need or plan to get done in the next day or two (grocery list, go to Lowe’s, mow, mop floors, etc.) The other list of items are bigger more project oriented items (re-do the home office so it’s more functional, reorganize the garage, paint the shutters, learn about gardening). These things randomly pop into my head at the most inconvenient times like when I’m trying to go to sleep or when I’m sitting at the ugly non-functional home office desk trying to get work done. For these “bigger” items I use an electronic form of tracking because I will totally lose a piece of paper before actually accomplishing them. 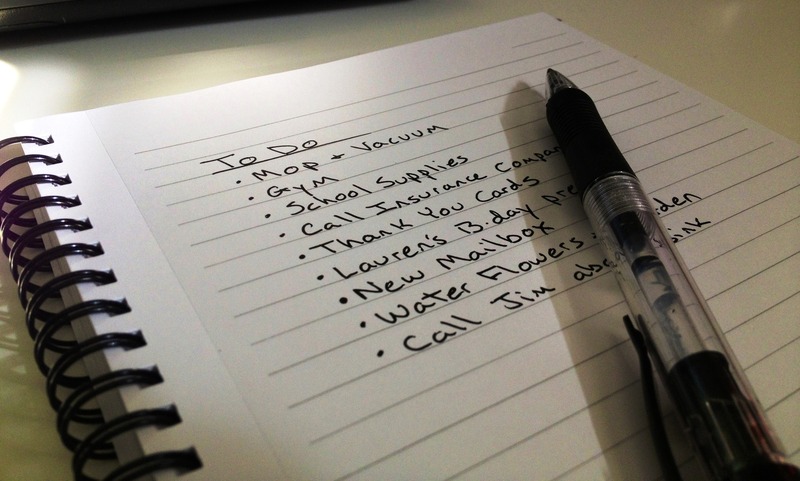 Plus, this list requires some continuous prioritization which is easier to do with an electronic solution. I use two super cool and super free software tools called Trello and Evernote. You can use them on your computer or on your phone/tablet or both. Very easy to use and convenient (for those random times when ideas pop into your head). The reality with these “bigger” items is that they don’t get done. Well, I should better phrase that in saying they don’t get done as often or with as much priority as the daily tactical items like picking up groceries. This is a major reason why I write them down separate from the daily items. They require different processes to get them accomplished. So simple…why does it help to write stuff down? For me it’s because empirical evidence proves I’ll forget them…until the next inconvenient time they pop into my head. Since these items are important I rather not forget about them and knowing I have “the list” reduces that anxiety. The other reason is because I get sidetracked and I know I’ll get sidetracked unless I go to “the list” to remind myself of the stuff I need to get done. Ok…so we’ve covered step number one in more words than were probably necessary. Step two is simply get the stuff done (also known as GSD)! Easier said than done on many days. Life does get in the way sometimes as it should and that is perfectly ok. My biggest struggle with the tactical items is keeping things in balance. Some days you really do need to say, “screw the list.” If you let the tactical list run your life, you’ll miss out on life. For me the area where I struggle is keeping this in mind but also knowing that if I don’t hack away at the to do list, the to do list will be haunting me calling my name in the middle of the night the same way the cookies do. So it’s a matter of balance. Some days I just need to feel super accomplished and get a lot of things done. Other days I have to methodically force myself to just mellow out and enjoy other things in life, like smelling the roses…and cookies. The tactical list is usually easy to hack through when I’m focused on it (and have time for it). The list of “bigger” items tends to take longer to achieve and some of the items never actually get check-boxed. There are a lot of reasons for this including cost, level of difficulty, and true priority. Measuring all of these factors usually results in a bit of procrastination and let’s face it…when you’ve got all the things on your tactical list to do who has the time or energy for painting the shutters? However, this list is still important because when I DO accomplish something on it I feel incredible like I’m standing on top of a mountain. Please note, I have never actually stood on top of a mountain but I imagine it feels somewhat similar. Anyway, this weekend I finally re-did my home office and I couldn’t be happier. It had been bugging me for quite some time and while it’s still not perfect it’s still an accomplishment and an improvement. I try really hard to do at least one “bigger” project oriented item per week or weekend to fuel the positive energy I get out of it. It’s easy to get caught up in all of the excuses and challenges with accomplishing items on this list. Sometimes you just gotta kick yourself in the pants and “get er done.” Throw all plans out the window and just get going on the project. Not perfect but majorly improved. So yeah, I got in a rut recently. I spent some time updating my lists and it felt really therapeutic and cleansing. If you find yourself in a rut, write some stuff down, get some stuff done, pick one of your big items, get er done, step back and enjoy your accomplishment. Rinse and Repeat. I promise you’ll start to feel better.